Posted Prices honoured for "IN STOCK" Trailers only! JSE Is now a Tritan Trailer Dealer. Taking special orders for Snowmobile trailers now! New Year Sale price! Only 2 left! Karavan Single Snowmobile Trailer, 13" Wheels, Carrying Capacity: lbs, Approx. Curb Weight: lbs, Cargo Deck: "W x 10'L, OA Width" 72", 1/2" Marine Grade Plywood, 1 TD Bar, 2" Coupler, 4 prong flat electrical. Triton Aluminum 10'Long Double Snowmobile Trailer, Tilt Load, Carrying Capacity: 1825 lbs, GVW: 2200 lbs, 13" Radials on Galvanized rims, Approx. Curb Weight: 375 lbs, Cargo Deck: 101"W x 120"L, OAL 172", 1/2" Marine Grade Plywood, Tilt spring assist kit installed for ease of operation, Wishbone style tongue, Anti-rattle tilt lock system, 2 Tie Down Bars, 2" Coupler, Approx. Hitch Height: 18", 4 prong flat electrical. Triton Aluminum 10'Long Double Snowmobile Trailer, Quick slide tie down bar tracks, Carrying Capacity: 1825 lbs, GVW: 2200 lbs, 13" Radials on Galvanized rims, Approx. Curb Weight: 375 lbs, Cargo Deck: 101"W x 120"L, OAL 172", 1/2" Marine Grade Plywood, Tilt spring assist kit installed for ease of operation, Wishbone style tongue, Anti-rattle tilt lock system, 2 Tie Down Bars, 2" Coupler, Approx. Hitch Height: 18", 4 prong flat electrical. Triton Aluminum 12'Long Double Snowmobile Trailer, Quick slide tie down bar tracks, Carrying Capacity: 1825 lbs, GVW: 2200 lbs, 13" Radials on Galvanized rims, Approx. Curb Weight: 375 lbs, Cargo Deck: 101"W x 144"L, OAL 196", 1/2" Marine Grade Plywood, Tilt spring assist kit installed for ease of operation, Wishbone style tongue, Anti-rattle tilt lock system, 2 Tie Down Bars, 2" Coupler, Approx. Hitch Height: 18", 4 prong flat electrical. 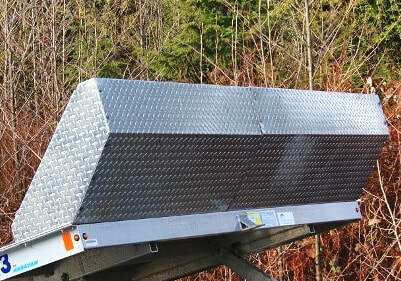 ​Two Piece Aluminum Checker-plate salt shield, fits double wide tilt load trailers. Can also be trimmed to fit a single trailer. ​Triton All Aluminum 10'L Double Snowmobile Trailer, Drive on / off configuration, Carrying Capacity: 1955 lbs, GVW: 2500 lbs, ST205/75D14C Wheels, Approx. Curb Weight: 545 lbs, Cargo Deck: 101"W x 144"L, OAL 215", 1/2" Marine Grade Plywood, 2 TD Bars, 2" Coupler, Approx. Hitch Height: 18", 4 prong flat electrical. 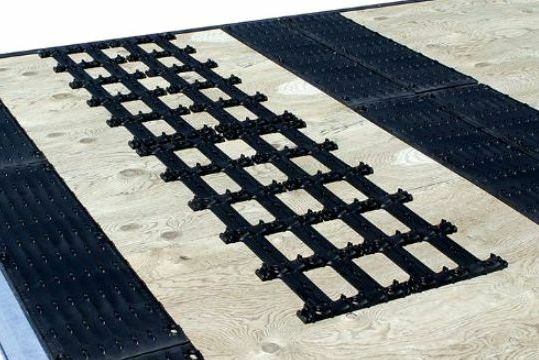 Front Ramp / Salt shield as shown in photo not included in price. New and Used Utility Trailers, Landscape Trailers, ATV Trailers, Motorcycle Trailers, Horse and Farm Trailers, Snowmobile Trailers, Boat Trailers, Small Aluminum boats, Trailer Parts and Accessories. We Take Trade Ins of used Factory built products! Servicing the Greater Vancouver and Fraser Valley areas; Coquitlam, Port Coquitlam, Port Moody, Maple Ridge, Mission, Abbotsford, Langley, Surrey, Chilliwack, BC Canada.